One of the biggest uses of zinc is in making protective coatings for steel. The development of the wide range of zinc coatings arose from two happy accidents of chemistry, the relatively slow and predictable rate of atmospheric corrosion of zinc compared with steel, and the relative positions of zinc and iron in the electrochemical series. Zinc will corrode preferentially to give cathodic protection to iron when both are in contact in an aqueous medium. This is used to good effect to protect immersed structures such as ships’ hulls, drilling rigs and pipelines. It also means that any bare areas in a zinc coating on steel, caused by damage or operations such as cutting or drilling, are still protected by the surrounding zinc. Taken together, these two factors provide the basis of a unique corrosion protection system which uses some 4 million tonnes of zinc annually to protect around 100 million tonnes of steel. This represents almost half the total world consumption of zinc. Figure 1. Hot dip galvanising of fabricated steel. Other processes are available and are used where their specific characteristics are required. These include electroplating (also known as electrogalvanizing), flame sprayed coating, sherardising, mechanical plating and using zinc rich paints. Process developments in continuous galvanizing have enabled a range of coatings to be produced with very closely controlled thickness and surface finish. These can be formed and joined without significant damage to the protective coating. Along with these developments, a series of alloys for coatings have been produced. The most important of these are Galvalume and Galfan. Galvalume consists of about 55% aluminium and 45% zinc with a small amount of silicon. It is being used extensively around the world as it has better atmospheric corrosion resistance than pure zinc however, it loses the ability to protect any exposed steel such as that at cut edges. Galfan is a zinc, 5% aluminium alloy containing small amounts of rare earth metals which has a substantial and growing niche market in which its properties are valuable. Its corrosion resistance is better than that of zinc and it retains some cathodic protection capability. Building and construction industries use at least two thirds of all the coated steel strip produced, mainly for roofing and cladding of commercial and industrial buildings. Much of the material used in building has a mill-applied organic coating on top of the zinc. Buildings in this ‘colour coated’ steel are a familiar sight, particularly in out-of-town shopping centres and industrial estates. Colour coated steel can provide lifetime protection for such buildings. More recently, the use of galvanised steel in domestic buildings has grown considerably. The traditional method of building in much of Europe is to use solid brick or block exterior plus internal walls. This is in contrast to North America and Australia, where timber framing has been the most common form of construction. With the increasing cost of timber, there is a substantial move towards the use of steel frames formed from galvanised steel strip, for both the external walls and the internal partitions. This also takes advantage of the fact that the steel does not warp or rot. The same interest extends to products such as window and door frames and, providing they can be made visually acceptable, to roofing and cladding. 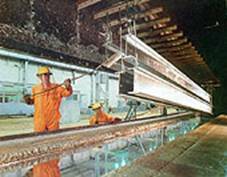 Hot dip galvanizing in its original form (as applied to fabricated steelwork) is also a growing industry. That is not true of many industries that are more than 150 years old and still recognisable to someone from that era. The reasons for the process’s continued success are in the intrinsic relationship between iron and zinc, improved organisation of the handling of work in the plant and, most importantly, a better appreciation of the economics of corrosion protection. As these factors are better understood by design engineers, the tonnages of steel galvanized have risen steadily. In Europe the total annual tonnage rose from 3.6 million tonnes in 1983 to 4.6 million tonnes in 1996 and the trend continues. Another growth area is that of zinc castings, which is based on new alloys and new technology. Until the 1930s there were only two zinc casting alloys of any commercial significance zinc-4% aluminium pressure die casting alloys with and without 1% copper. Zinc casting now has a family of alloys - the specifier can choose the alloy and casting process most suited to their product. Zinc alloy castings are unique, particularly when produced by the pressure die casting process. They can be made to extremely close tolerances, with excellent surface finish, have a range of useful mechanical properties (especially ductility) and can receive a wide range of applied finishes. As a result, zinc castings find a range of applications from automobiles to zip fasteners. A key part of the modern materials world in which zinc finds itself is recycling. Zinc, in common with all metals (and unlike synthetic materials) can be recycled indefinitely without degradation. This has been appreciated for many years and zinc scrap and residues are classified, traded and priced according to their zinc content and to the economics of turning the scrap into a useful product. There is more to recycling than simple returning a material to its original state. This is particularly true for zinc, for which scrap and residue arise in some ten different ways and are recovered into a variety of different forms. Old scrap zinc sheet is easily returned into metal ingots. Process residues from galvanizing (drosses) are highly valued raw materials for the production of zinc pigments and other chemicals. Brass scrap is recycled entirely within the brass industry. And when zinc coated steel is recycled, the zinc volatilises, and is captured in the flue dust and can be used alongside zinc ores in the production of primary zinc metal. Availability of zinc for recycling depends principally on two factors, namely the production of process scrap from current consumption and the arising of zinc from end of life products. Process scrap recycled immediately and virtually completely. However, given the long service life of many products containing zinc, the arising of old scrap is dependent on the usage of zinc many years ago. The total amount of zinc scrap is rising around world and is estimated at about 3 million tonnes. The vast majority of this is recycled or in store, pending recycling. No more than 5% is unaccounted, a record that few materials can beat. Source: Materials World, Vol. 6 no. 4, April 1998.